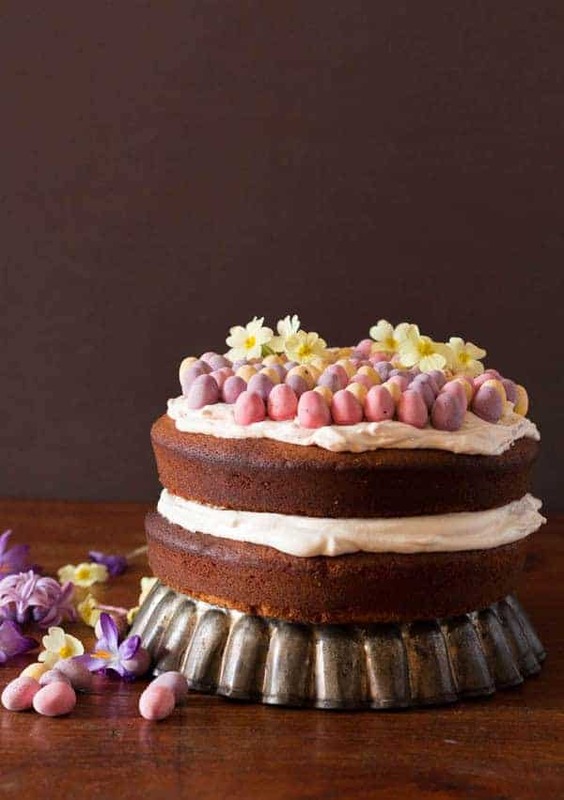 You are probably thinking about your Easter recipes at the moment right? 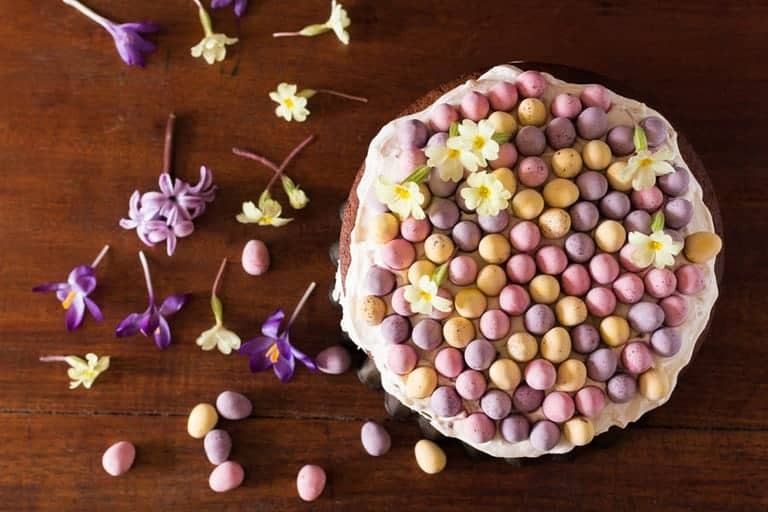 Well how about adding this hazelnut cake topped with gorgeous coloured mini chocolate eggs and stuffed with honey whipped cream to your list? And whilst you are at it, see how many Easter eggs the kids (erm erm you) can eat in a five minute period. Oh the fun you all could have. This cake has some serious flavour going for it. Think roasted hazelnut flour; more nuttiness from the spelt flour; sweetness from honey and a whole sprinkling of lemon zest. Then of course, it is all about the gorgeous coloured speckled chocolate eggs on the top. Just the right sort of show stopper cake I will be bringing out to finish off our extended family Easter lunch. Heck, I might even go all out and make them a chocolate cake too. This cake, like lots of sponge cakes, is actually quite easy to make. And is really useful to make with children, as licking out the bowl can keep them quiet for at least a whole quarter of an hour. 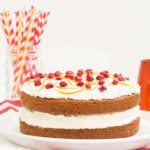 The whipped cream is my standard icing – it is not as sweet as normal icing, and you can add flavours like the lemon or raspberry jam with no hassle. So here is my lemony, hazelnut chocolate Easter egg cake. Please, please, please try it for Easter. Easy Hot Cross Buns with Mango and Coconut. 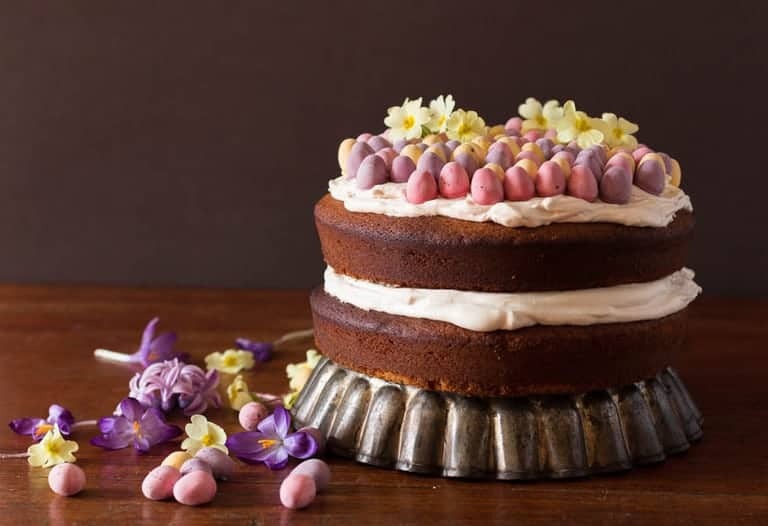 Don't forget to tag #recipesfromapantry on Instagram or Twitter if you try Hazelnut Easter Egg Cake! It is really, really awesome for me when you make one of my recipes and I'd love to see it. You can also share it on my Facebook page. Please pin this recipe to Pinterest too! Thank you for reading Recipes from a Pantry. 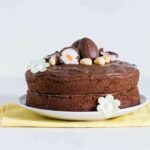 A lemony, hazelnut chocolate Easter egg cake. Line and grease two 20 cm cake tins. Toast the hazelnut in the oven for 5 mins, then remove from the oven and let them cool. Rub off most of their skins and whizz in a food processor into hazelnut flour. Transfer the hazelnut flour into a large bowl and sift in the spelt flour and baking powder. Then add in all the other cake ingredients and beat using an electric hand whisk or a stand mixer. Do not over mix the cake batter. Divide the cake batter evenly between the 2 cake tins, level the tops with a spoon and bake for about 25 mins or until cakes are golden and an inserted skewer comes out clean. Remove the cakes from the oven, let them cool for about 5 mins before transferring them to a cooling rack. Then transfer one sponge onto the cake tray and spread half of the honey whipped cream on top. Then place the second cake on top and spread the remaining whipped cream on top. Then decorate with the mini chocolate eggs and primroses and serve. Basic hazelnut sponge from Love Bake Nourish. [br]Keep an eye on the hazelnuts when you are whizzing them up so that they don't turn into nut butter. Here are some other chocolaty or other Easter recipes from around the web. Creme egg cheesecake from Taming Twins. Crunchy, chewy, fruity muesli chocolate nests from A Mummy Too. 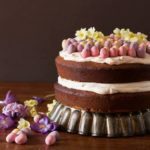 Creme egg chocolate drizzle cake from Lavender and Lovage. Creme egg chocolate ganache tart from Baking Queen 74. Cardamom scented treacle tart from the Hedgecombers. Hot Cross Bun Spiced icecream from Glamorous Glutton. Chocolate coconut flapjacks from My Fussy Eater. Chocolate and lemon curd pancakes from Tinned Tomatoes. Chocolate chestnut fondant from Cooksister. Coconut oil brownies with maple roasted sweet potato from Veggie Desserts. Thick and fudgy double chocolate cookies from Pinch of Yum. That is what all the testers thought too. Wow that looks amazing. I love your pictures too. It was fun coming up with this idea Cat. My pleasure GG. I am quite chuffed with this cake. I will most definetly try this one out! And enjoy every mouthfull Paola. Great job lady, it looks BEAUTIFUL! Please can I invite myself over for a slice…? Yes, please do pop over, it was such a joy to make that I am happy to do it all over again. What a stunning cake Bintu. I just want to dive in. Oh how I am craving a slice. You are such a tease! That is the plan Jacqueline. To tease all my readers. It was a little bit hard cut into Margot. Well, I just want to face plant myself right into this, yum! Face planting sentiments greatly appreciated. No worries Lucy. I liked your bake. What a stunning, show-stopper of a cake. 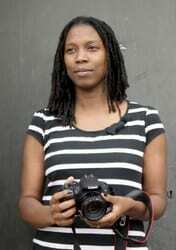 And your photography is always so amazing. Just lovely, Bintu. What a beautifully delicious looking cake!!! Oh Bintu – that’s almost too pretty to eat! 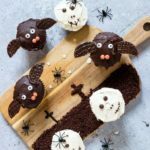 It also features some of my all-time favourite flavours – a very happy Easter indeed 🙂 Thanks also for linking to my cake! Oh my word, that looks delicious, perfect for Easter! So pretty to look at and it sounds lovely to eat too. I adore your photos and styling =) Pinned. That looks fab and just up my street. Lots overly the Easter recipes seem to be overly chocolatey. This one could almost be considered healthy in comparison! 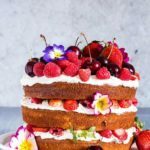 This looks amazing, like Victoria Sponge, but upgraded. Well done, such a great idea for our Easter dessert table. Thank you for sharing! What a stylish and I know delicious cake this must be Bintu, it really captures Easter so perfectly, I adore it! Ooh what a fabulous cake Bintu AND beautifully decorated too. Not sure how I missed this one. I do much of my baking with spelt, although I always use half wholemeal, half white – do try it as it gives an even nuttier flavour and a great texture. This is the most beautiful Easter cake ever!